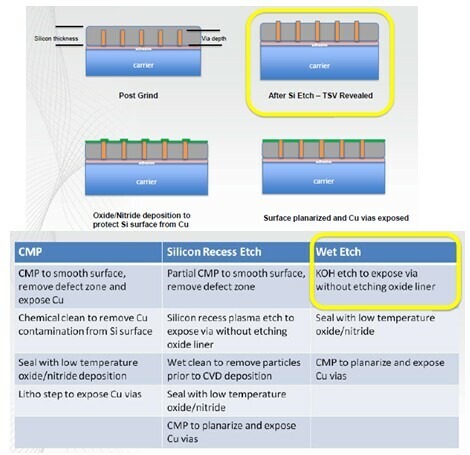 Oerlikon systems discussed PVD solutions for TSV metallization. Since sputter deposition is line-of-sight, it has been difficult for it to fill high AR features. 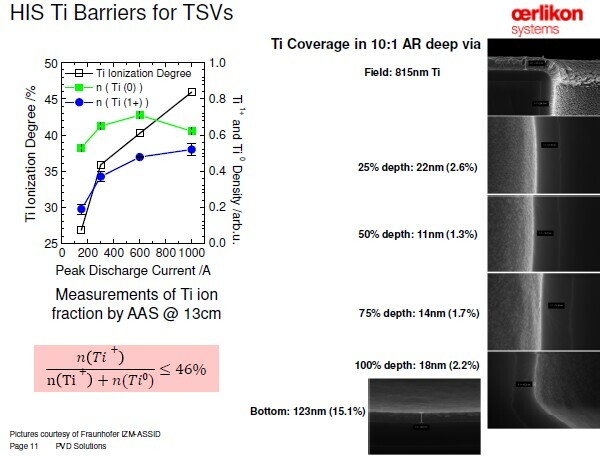 Ionized PVD addresses this coverage in high AR issue, but significantly increases the equipment costs. Eric Beyne of IMEC discussed the 3D technology maturation process and COO issues. 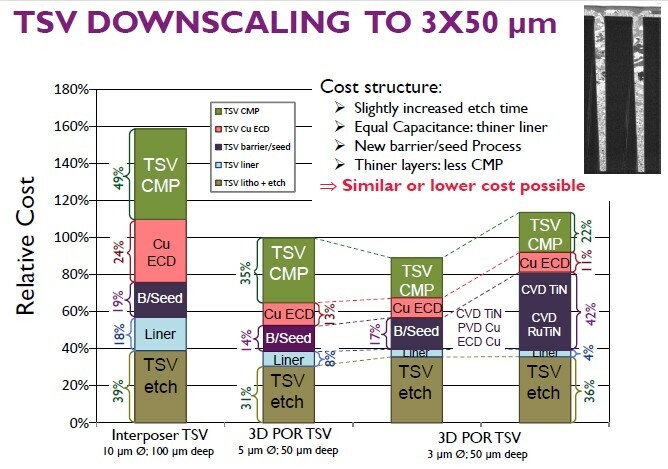 The std IMEC 3DIC TSV process has had 5 x 50 um TSV, but recently they have indicated that a more to 3um dia TSV may be warranted. 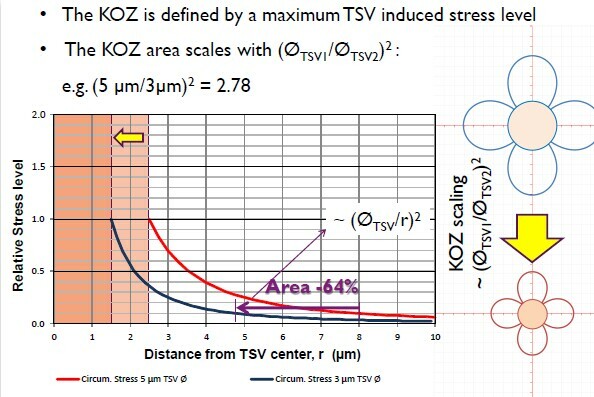 One reason is that a reduction in the dia of the TSV correspondingly reduces the keep out zone (KOZ) requirements. 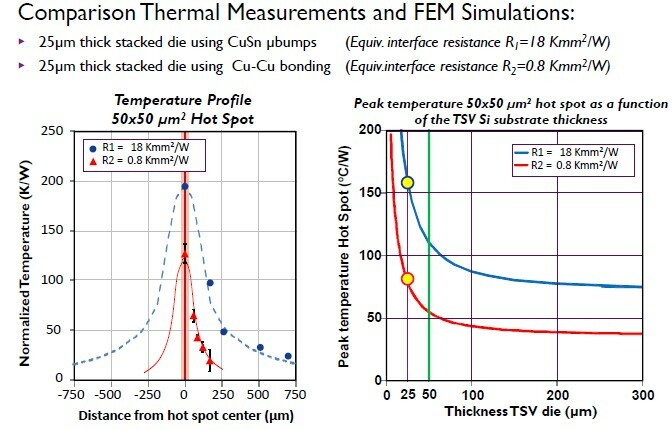 Another interesting comparison was the thermal impact of Cu/Sn intermetallic bumps vs Cu-Cu bonds, where the direct copper-copper bonding shows a significant reduction in temperature. Ron Huemoeller of Amkor addresses future packaging needs. 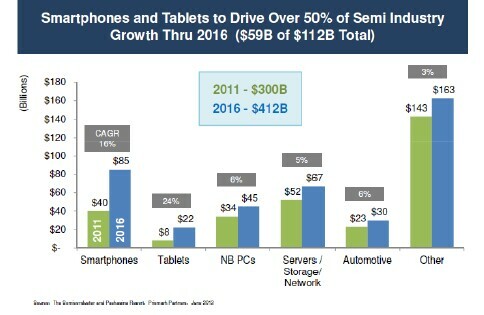 He showed an interesting Prismark slide, which showed that smart phones and tablets will account for more than 50% of the Semi Ind growth through 2016. In terms of interposers, Ron shared his views on interposer density vs application space. IFTLE has mentioned several times that the only interposer programs that have been announced are ones requiring high density interposers only available from foundries. Although this statement still holds true, Ron points to “ lower end smart phones and tablets” as potentially requiring interposers with less than 8 um l/s which could be fabricated by an OSAT RDL line. 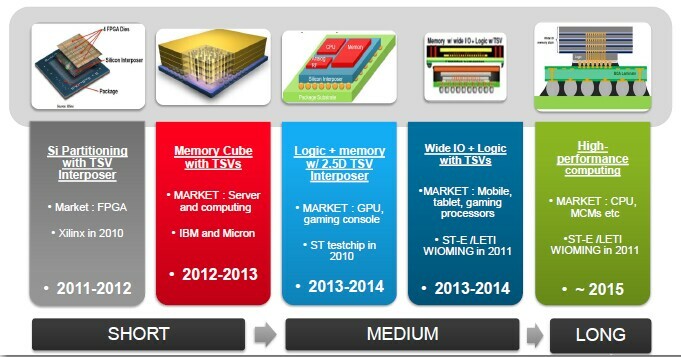 In terms of memory supply for 2.5/3D products, Ron lists on Elpida (Micron) and Hynix as currently supplying. 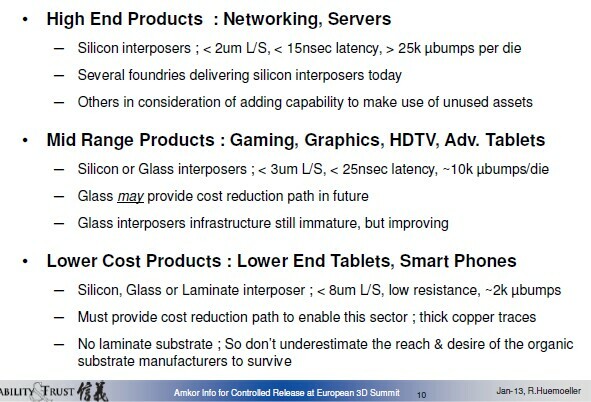 IFTLE 134 SEMI 3D European Summit – Is the Wide IO Driver Dead ? SEMI Europe held their first European 3D TSV Summit in Grenoble in late January with a theme of “On the Road towards TSV Manufacturing”. Yann Guillou of Semi reports 320 attendees from 20 countries, 4 keynotes speakers, 22 invited speakers and 22 exhibitors were in attendance. ST Micro presented their strategy for bringing 3D to manufacturing. 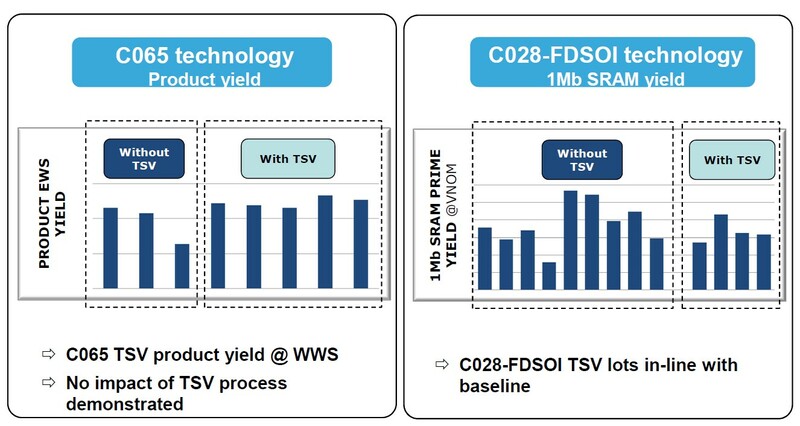 An interesting slide compared yields with and without TSV. 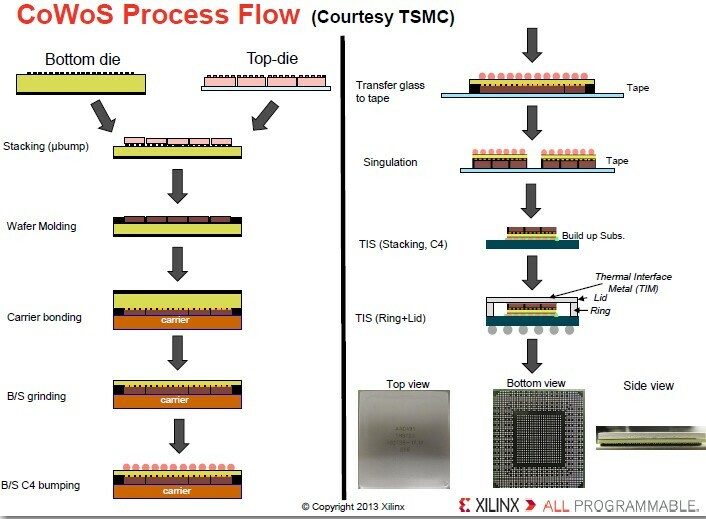 They discussed digital / analog partitioning and memory on application processors as driving applications. Kimmich of ST Ericsson discussed the application of 3D integration to smartphones. 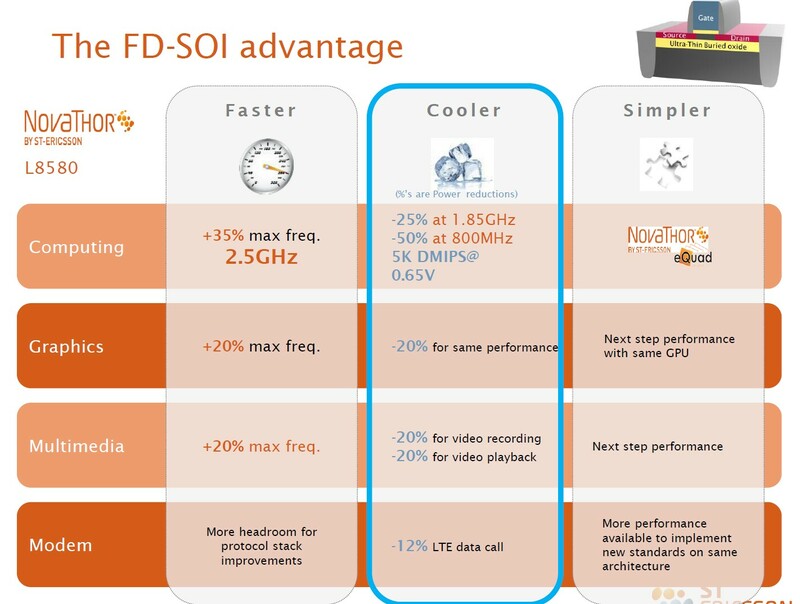 They were hyping fully depleated SOI technology (FD SOI) as being a faster, cooler and simpler solution. 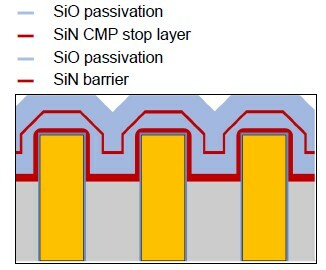 A cross section of the device is shown above ( STM wide IO memory on applications processor). The goal is to offer the same bandwidth as a quad channel 32 bit LPDDR2 interface but with half the power consumption. These are 10um dia TSV on 40 um pitch with AR = 8. The Cu pillar connections are 20um dia on 40 um pitch . ST Ericsson reports there are still business issues concerning the wide IO business model. 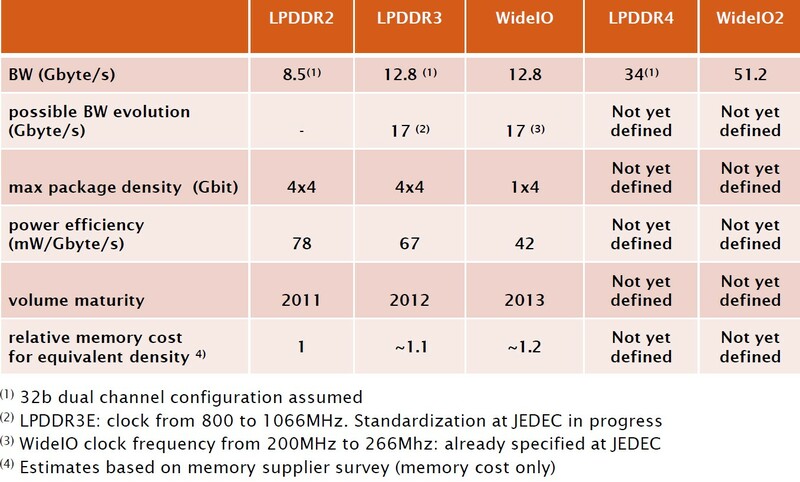 An interesting chart on Memory Options shows wide IO bandwidth capability the same as LPDDR3 although the DDR memory takes a significant hit in power efficiency. 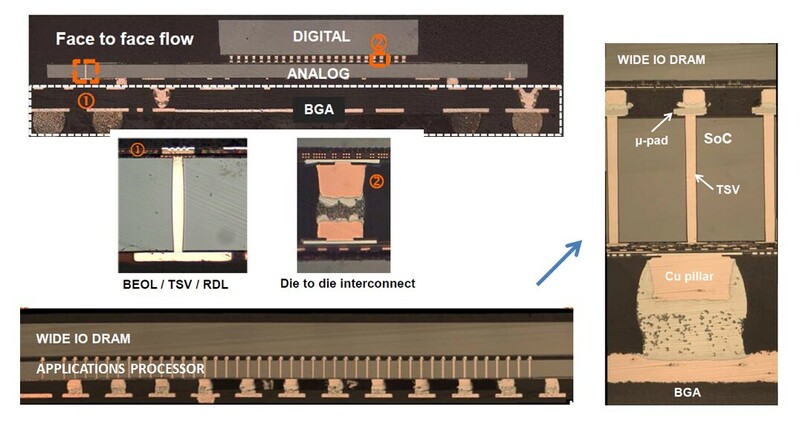 Another interesting conclusion is that PoP memory solutions offer better thermal performance since the thinned Si die in the 3D configuration result in poor lateral heat distribution. 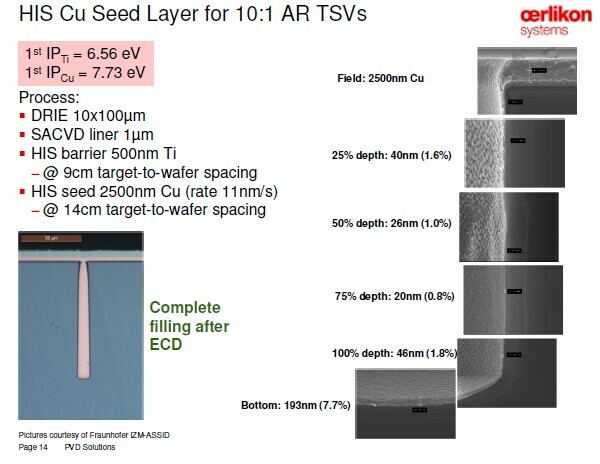 In fact, Kimmich concludes that although 3D TSV technology appears ready for mass production, wide IO technology is not yet a fit for mainstream smartphones. 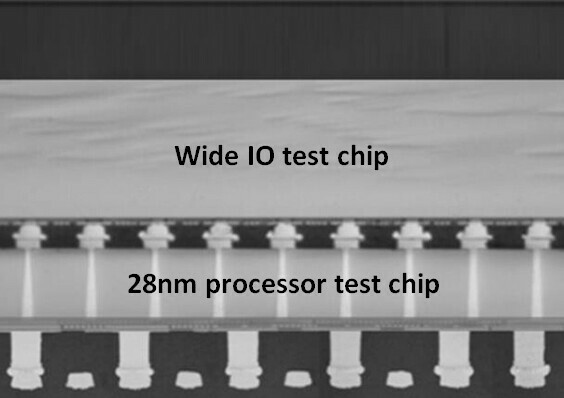 LPDDR3 and LPDDR4 will be used in this application due to better thermal performance and lower cost. Greenwood of GF reitereated their recent theme of global collaboration enabling the global supply chain. 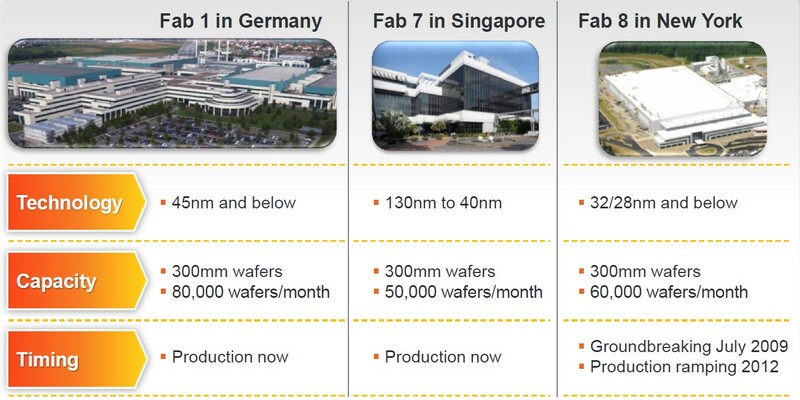 Of interest was his slide outlining the production at various GF sites. When it comes to 2.5/3D, GF is certainly well engaged across the world. The Fraunhoffer ASSID being on the same campus as Fab 1 Dresden is strategically aligned to GF collaboration. This co location insures “â? ?¦an intensive and frequent knowledge exchange at the engineering level”. 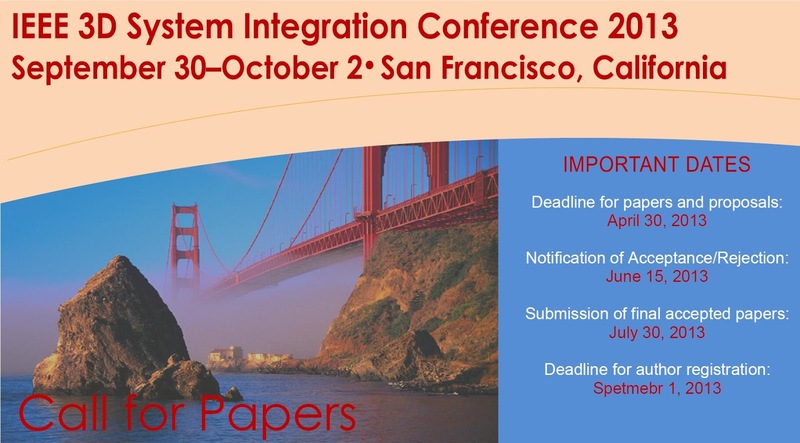 AS IFTLE has reported previously see IFTLE 125, “2012 GaTech Interposer Conference, part I”, Fab 8 in NY is responsible for 3D solutions and Fab 7 in Singapore is responsible for 2.5D solutions. Several 2.5D test structures were shown that were collaborations with Amkor. You are currently browsing the Insights From Leading Edge blog archives for February, 2013.